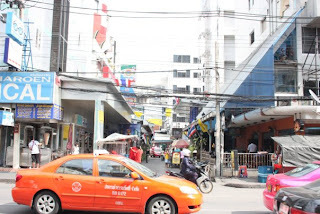 I decide to head over to Sukhumvit Road which is known for its shopping centers, restaurants and tourist attractions. I'm not even going to attempt taking a Sky Train or even a tuk-tuk. I will use a cab all the way. It just feels safer to me. I approach a pink cab and ask the driver through the passenger window if he can please take me to Sukhumvit Road. He doesn't understand me, so I show him a map. He rolls the window up and waves his hands around as if to say, "Woman, I don't know what the hell you're saying." I walk on. Tuk-tuk drivers are lined up on the curb and every second man asks me where I want to go. I ask another cab driver. 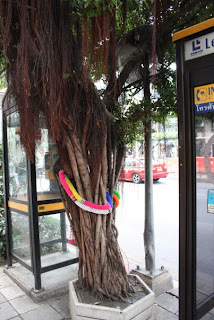 "Sukhumvit Road". Perhaps I'm not pronouncing it properly, which is why I have a map with me. Same thing. He doesn't want me to get into the car. I start huffing and puffing. What the hell? Finally, a driver understands me and off we go. "Um, I don't know," I say. 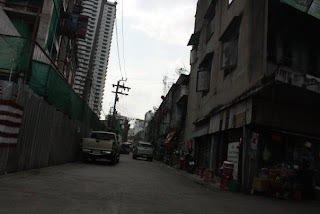 "Sukhumvit Road very long road," he saya looking at me through his rear view mirror. 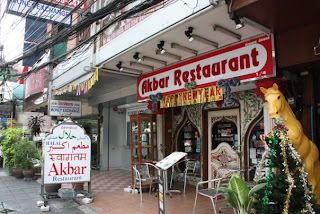 "I want Indian restaurant...do you know any?" I ask hopefully and also grateful that he can speak English. He drops me off somewhere and points to a blue sign saying that it's an Indian restaurant. He also tells me that I should first walk around a bit before going to that one. I do that. It's frightening walking along the pavement. Cars are almost touching the curb. That's how congested it is. 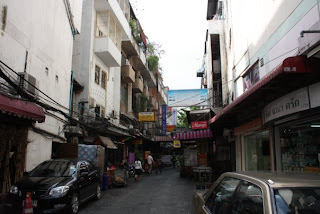 There are also a lot of alley's that look very dodgy, so I don't venture near them. I assume the "naughty massage rooms" are here. I find this restaurant, but it looks very dark and dingy with no one inside. 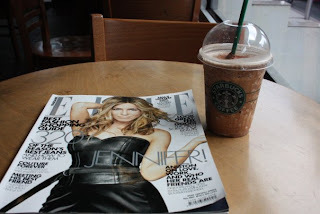 I find a Starbucks and settle down with an Iced Cherry Mocha. I'm bummed to know that they charge to use their Wi-Fi..